Giving Forum is back as a visually rich magazine. Filled with color photographs, illustrations by local artists and in-depth looks at issues addressed by the philanthropic community every day, Giving Forum is here to provoke conversation today with an eye toward tomorrow. Giving Forum is published twice annually. It is distributed to MCF members, including 2,500 leaders, trustees and staff of Minnesota’s top foundations and corporate giving programs. A digital version of each issue is available online and accessible to anyone with an interest in Minnesota grantmaking, including those associated with nonprofits, consulting groups, state government and others. 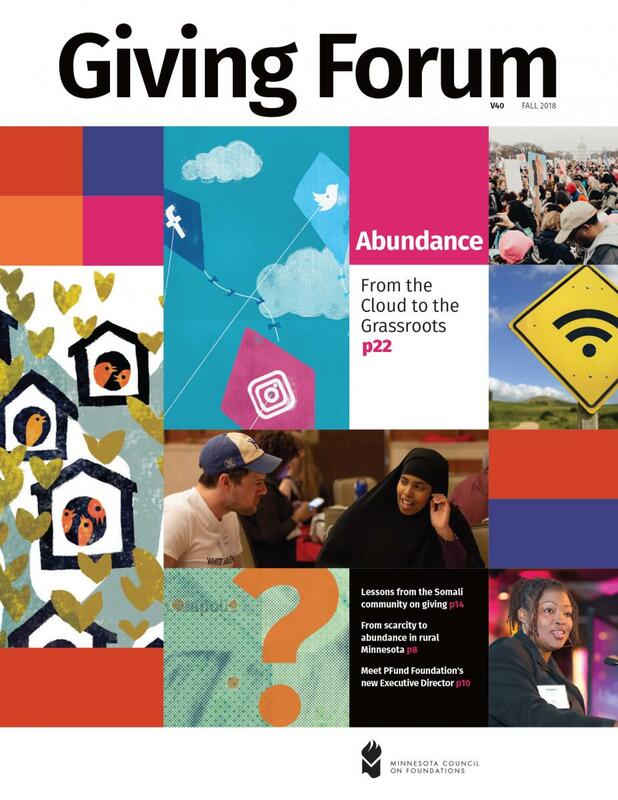 Published since 1980, Giving Forum has evolved from a newsletter into a visually rich magazine with a pronounced editorial voice, a diverse group of writers and contributors, engaging storytelling, and a thought-provoking, motivational and aspirational tone. Share your ideas and thoughts about Giving Forum. Sponsorships are available for MCF Members. For more information, see the Giving Forum Sponsor Benefits (PDF). To advertise, see the 2019 MCF Ad Rates (PDF) or contact Soon-Young Oh.